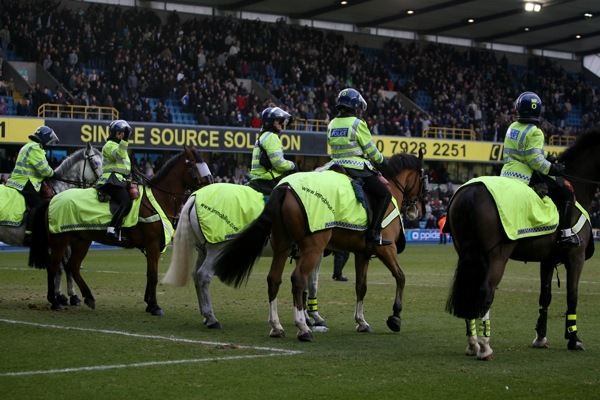 Mounted police patrol Millwall’s pitch after full time in the Lions’ League One match against Charlton Athletic. Millwall won 4-0 to maintain their promotion push. Charlton stay third, one point above Millwall and five points behind second-placed Leeds United. why they were on the pitch ill never know! 2 people went on the pitch after the game one of them was arrested the other was 8 years old.. hardly a threat to wot was left of the charlton fans! completely over the top from the police yet again! oh well if we perform like that for rest of the season we have every chance of getting back in the championship! COYL!!! Why Publish this picture? It has no reflection on what happened on the day – a terrific second half performance by millwall resulted in a 4 – 0 win with lots of happy millwall fans staying back at the end to cheer their team. Why not show lots of cheering millwall supporters instead of this one that may lead people to other conclusions????? Good luck, You deserved it. @ Richard – Steady, Mr Defensive. I didn’t publish it because it was Millwall, but because it’s an interesting photo – you don’t see mounted police on the pitch much. Why would Millwall fans complain about the Police going onto the pitch, wasn’t there a riot there some years ago when a lot of Police got hurt? You build a reputation, so take the consequences. I totally agree with Richard. I was more disturbed with having to listen to Status Quo’s “Rocking All Over the World” at the final whistle. Mr Ollie might like to know that there were many more interesting photos that he might like to have taken at the end of the match, not this one which is a touch of ‘here we go again’. He might also like to choose his caption words more carefully as to ‘patrol’ means to ‘go round or to perambulate’. In this case the horses stood motionless in front of the stand holding the Charlton supporters, only to walk off the pitch after a few minutes! I dislike Millwall nearly as much as Manure but i agree with Richard with regard to posting that pic.You must have known what conclusion people would draw on first seeing it.To say you thought it an unusual picture is frankly pathetic. Agree with Richard our club are doing all they can to change the image and rid ourselves of the idiots more than any other club in the country. All you are doing by publishing this picture is reinforcing most peoples pre-conceptions of our club. This does not help the clubs cause one bit but puts it back again. Cheers for aiding all the people who wish to rubbish our club. Been trying to persuade people that was Millwalls defence, which is why we could not score, they just reply it was Charlton that were the donkeys. Could you not post pictures of Charlton fans throwing bottles onto pitch instead of trying to make an issue that never existed. If you took the pictures you will know how well behaved we were and that if any trouble was caused it was in the away end. People like you that are keeping Millwall down, not the fans. “I didn’t publish it because it was Millwall, but because it’s an interesting photo” surely a photo of the Charlton fans throwing bottles on the pitch or the Millwall fans elated faces at there 4-0 drubbing of there local rivals would have been more “interesting” but NO as always the image of police on horse back at Millwall is far more interesting to the haters than the result ! well sir i laugh in your general direction and hope you never get the chance to take any more “interesting” photos at THE DEN ! South stand lower block 32. There’s noisy rivalry between Millwall and Charlton but NEVER has anything gone off. Shame that non-events like this are highlighted and the thousands of charity £s that were handed over before the kick off on Saturday afternoon never get a mention. Yeah its a good rivalry with little trouble reported in the past. But this was a big one. Millwall have never sold out for a league game, the fact you did meant it was a big one as i said earlier, as you could clearly see when you got all worked up and wanted to make the most of your day out and fair play it was a derby and your boys did well. We sold out, we wanted some banter. but our boys let us down… add all this up and the fact it was a south london derby to boot means that it could of gone off with all the excitement flying around.